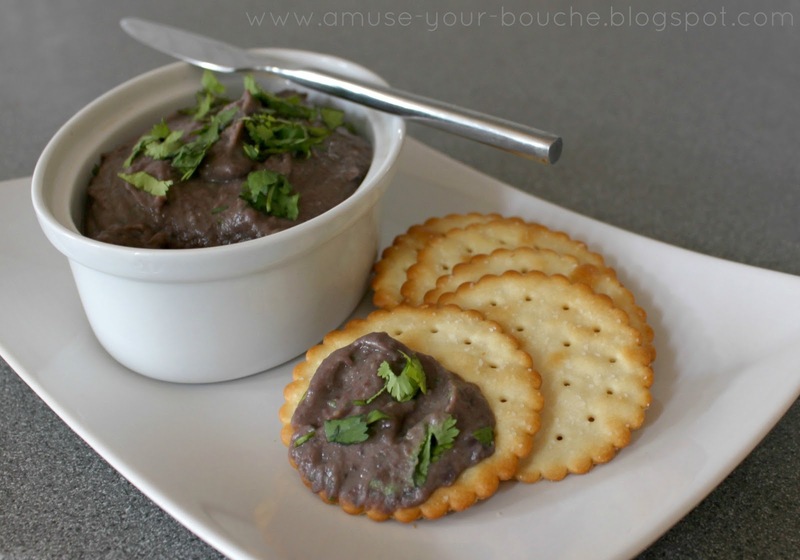 Welcome to Easy Cheesy Vegetarian, formerly Amuse Your Bouche! No, this isn’t an April Fool. I really am posting a recipe with only 4 ingredients (plus salt and pepper, but surely they don’t count?). The thing is, I don’t often have time to spend an hour in the kitchen before lunch every day. You know when your alarm clock goes off, and the urge to press ‘snooze’ is just overwhelming, and you end up pressing it about twelve times in a row? Yeah, that’s where my mornings usually go if I have nothing in particular to get up for (please tell me other people do this too). 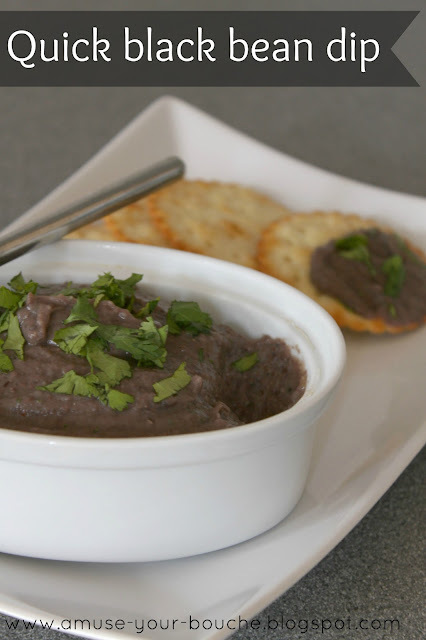 This black bean dip, however, only takes about three of your precious minutes to throw together – so there’s plenty of the day left to spend in bed. Despite the header for this blog saying ‘Simple vegetarian recipes’, I always feel a little guilty when I post a recipe as quick and easy as this black bean dip. Then I remember that some of you are probably just as lazy as I am, and would appreciate a recipe like this. If not… you’re in the wrong place. I’m not big on fussy recipes that take hours to make. It’s crazy how much flavour you can get out of just 4 ingredients. This dip is delicious. It makes about a cup and a half, but I’d happily finish the lot with a spoon (um, I seem to say this a lot… I swear I don’t actually do it. Usually). It’s also seriously versatile. You can spread it on crackers, like shown here, but I’m also dying to try it in a Mexican-style wrap with some sautéed veggies (and a bit of cheese, obviously), or maybe even inside a grilled cheese sandwich? Ugh yes. I wish I’d made more. Luckily it won’t take long to make another batch (do you get it yet? It’s quick). 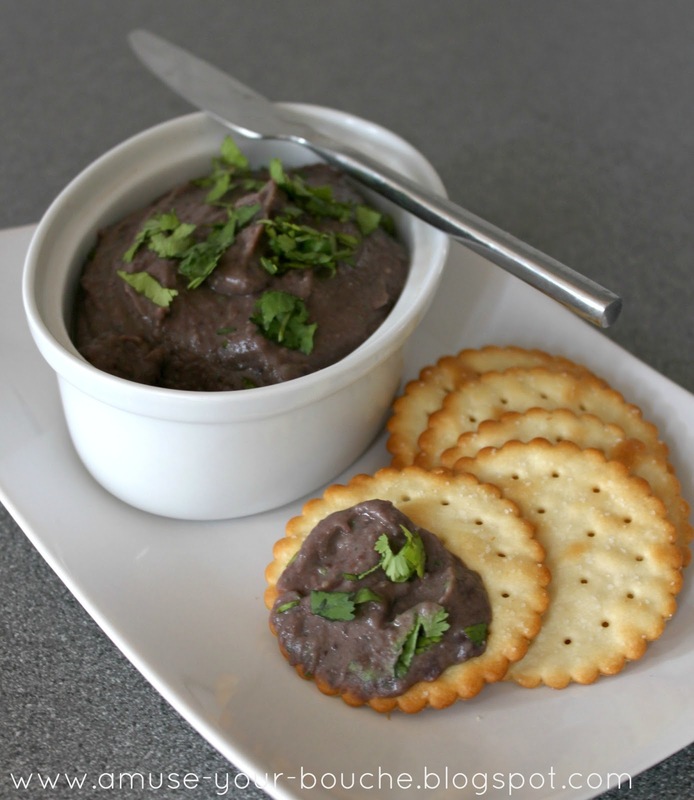 Blitz the garlic and coriander in a small food processor, and then add the black beans and hot sauce. Season generously, and blitz again until smooth. Top with fresh chopped coriander to serve, if desired. Thanks! Check your email to confirm your subscription. Yes, please sign me up for recipe emails! i love easy recipes! looks great! Yay for quick and easy! I am a big fan. I love simple yet delicious recipes like this! I love cooking delicious vegetarian food. Here on ECV, you'll find hundreds of easy, straightforward, and (most importantly) delicious vegetarian recipes. ©2019 Easy Cheesy Vegetarian. Design by Purr.